– Jean-Pierre Boudot: Kempny’s »Adampol« elucidated: a Polish settlement in Anatolia the mid 19th century. – Erland Refling Nielsen, René Manger & Andreas Martens: First records of Forcipomyia paludis (Diptera: Ceratopogonidae), a midge parsiting dragonfly adults (Odonata: Libellulidae), for the Balearic Islands, Spain. – Marie Stille, Bo Stille & Asmus Schröter: Lindenia tetraphylla – new for the island of Kérkira (Corfu), Greece (Odonata: Gomphidae). 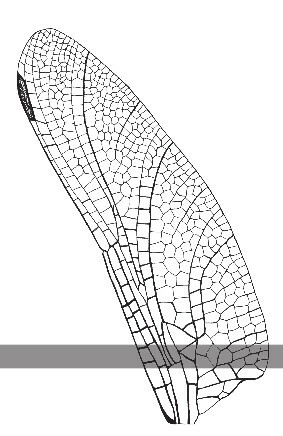 – R. Babu & Supriya Nandy: Eight new records of dragonflies from Jharkhand State, India (Odonata: Aeshnidae, Gomphidae, Libellulidae). – Jean-Pierre Boudot: A brief observation of egg laying in Lindenia tetraphylla (Odonata: Gomphidae) on Kriti (Crete), Greece. – Cornelio Andrés Bota-Sierra: Nine new records of Odonata for Colombia from the Orinoco Basin (Lestidae, Calopterygidae, Heteragrionidae, Coenagrionidae, Libellulidae). – Malte Seehausen: & Lavinia Schardt: A small saline spring-fed pond as habitat for Aeshna cyanea and Pyrrhosoma nymphula (Odonata: Aeshnidae, Coenagrionidae). – Fons Peels: The occurrence of Ischnura senegalensis in the Canary Islands, Spain (Odonata: Coenagrionidae). – Matti Hämäläinen & Milen Marinov: Hivaagrion nom. nov., a replacement name for the preoccupied genus-group name Bedfordia Mumford, 1942 (Odonata: Coenagrionidae).